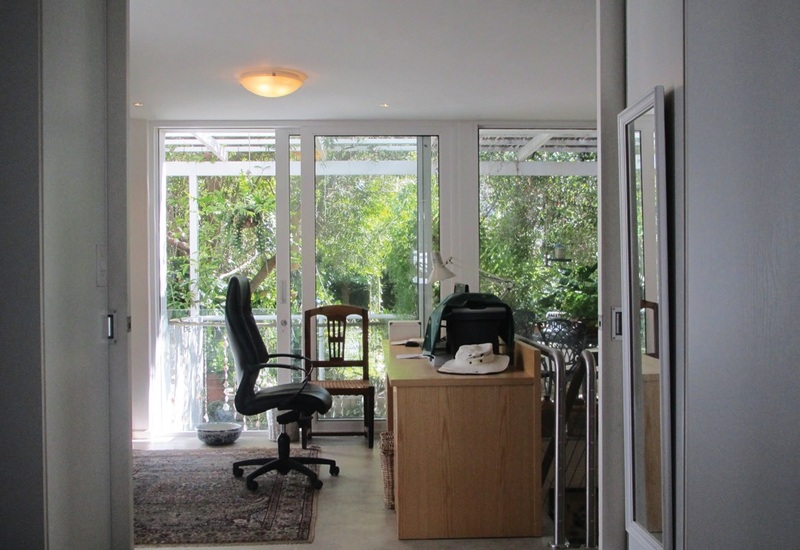 THIS BUILDING, located in the historic core of Stellenbosch, houses an active senior couple who recently moved from the main house, an existing 1900 historical building, to make it available for their daughter and her family. They will ll share the garden. The first necessary decision was where to position the new building. 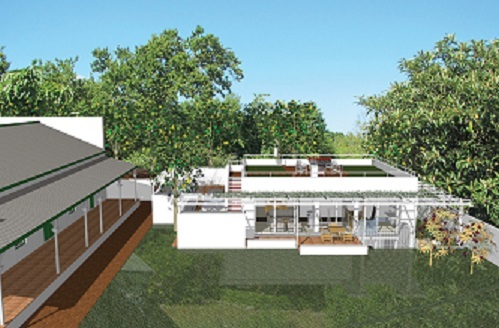 A site on the historical building line on Die Laan was chosen, in order to retain the existing garden towards the north. This decision required a municipal waiver to alter the building line and coverage. In addition, an archaeological study had to be undertaken to record the remains of the previous foundations. The decision also required careful judgement as regards the height and character of the new building. 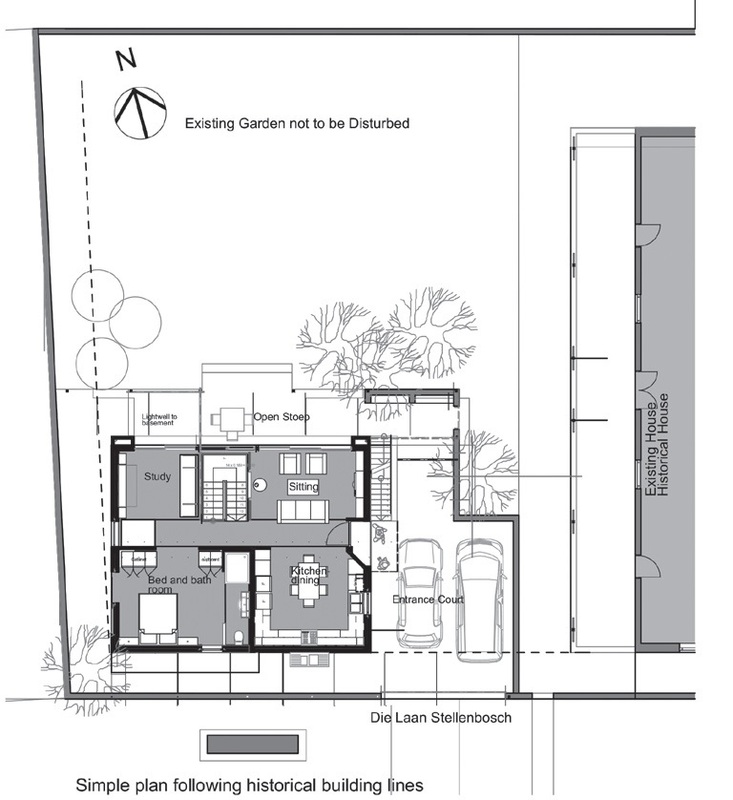 A single-storey structure was not suitable as it would occupy too much of the garden space, while threedimensional studies showed a conventional double-storey was not appropriate next to the garden, as it would compete with the historic building. These considerations generated the idea of constructing a basement to accommodate the second bedroom, TV room and utility room. The plans would retain the small footprint of a doublestorey, while keeping a ‘low-profile’ subservience to the main house. In terms of architectural language, the architects and clients wanted a building that was clearly contemporary but sympathetic with the old structure. 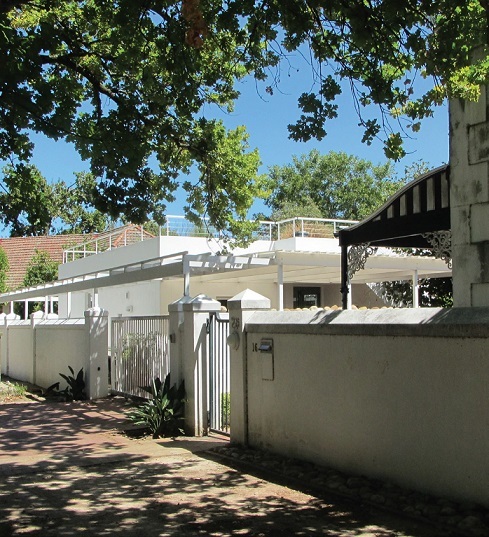 They achieved this by continuing the existing boundary wall with its pyramid-topped piers, by reflecting the old building’s simple, traditional, white-walled architecture, and by picking up the line of the old verandah with a stoep of similar height and a new pergola that now enwraps the new house in its entirety. 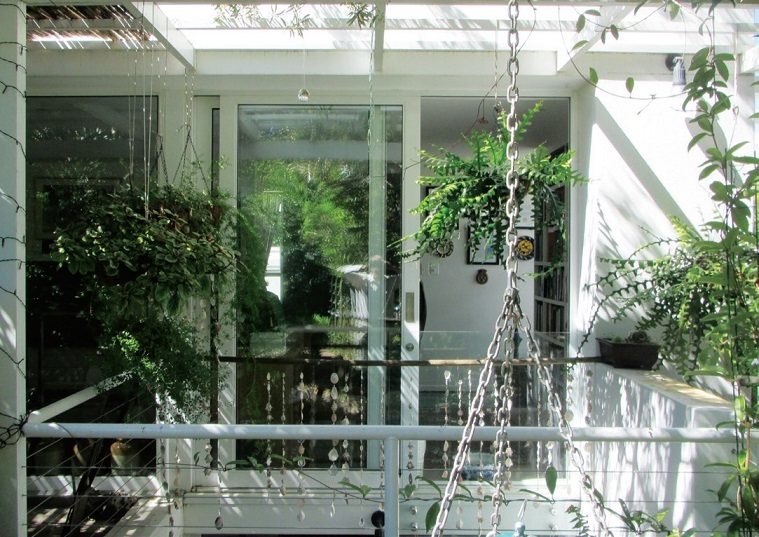 This strategy of conserving the dominance of the old house produced a few unexpected benefits: the pergola surrounding the building will provide excellent climate control, particularly when the deciduous creepers have matured; the basement with its skylights has an underground-level court providing sun and a view of the garden, plus a coolingeffect in summer; and the flat roof, which reinforces the low-profile idea, provides space for a roof garden – this, in turn, not only gives excellent insulation, but also a splendid view of the surrounding mountains and the Eerste River. Added to the double-glazing, solar heating and LED lighting of the new building, the structure has also succeeded in maintaining a rather low carbon footprint.